U14 Girls: (Friendly) Northumberland 3 Durham 4 -- Goals from Keira Skelton (2) and Lily West (2) help Durham to victory. Lancashire beat Cheshire 5-0 in the West League play-off so Durham travel to the Red Rose county to play the U16 girls Northern Counties semi-final. Merseyside beat Northumberland 5-3 (aet) in the U16 Boys Northern Counties semi-final. Northumberland were, at one stage, 3-0 ahead but Merseyside fought back to be level by full time then scoring twice in extra time. Merseyside will be at home in the final. The girls representing Easington Colliery Primary School will head to St Andrews, home of Birmingham City FC, on Saturday 4 May to participate in the National finals of the ESFA Danone Schools' Cup for Girls. The dates for the following cup finals have been confirmed. All matches will take place at The Graham Sports Centre, Maiden Castle, Durham. Kick off for all matches will be 4.30pm unless otherwise stated. U18 League Cup: St Robert of Newminster RC 2 St Thomas More Catholic School 2 (St Thomas More won 4-3 on penalties). This is the first occasion that St Thomas More have won the U19 League Cup. U15 County Cup: Cardinal Hume Catholic School 1 Red House Academy 3. 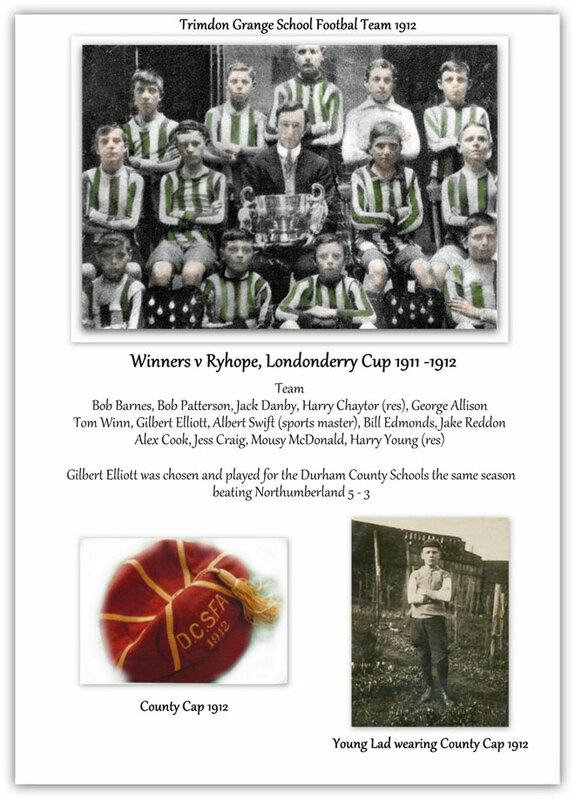 In appearing in their second County Cup final, the last being in season 1994-95, Red House were successful for the first time. U18 Senior Knockout Cup: St Leonard's RC 4 Cardinal Hume Catholic School 2. A great game with St Leonard’s gaining a half time lead but Cardinal Hume came back in the second half. The game was settled in the last minute. After finishing as runners-up in 2016-17 St Leanard's managed to win the trophy at the second attempt. U16 Bert Hodgson Trophy: St Wilfrid's RC College 0 St Jospeh's Catholic Academy 0 (St Joseph's won 3-1 on penalties). A good U16 final, with two evenly matched sides, which saw St Joseph’s beat St Wilfrid's on penalties. This is the second time St Jospeh's have won the Bert Hodgson Trophy. U14 CIC Cup: St Joseph's Catholic Academy 2 Longfield Academy 1. Longfield took an early from a super long range attempt. St Joseph's, a short while later, were back on level terms when they pounced on a defensive error. Just before half time St Joseph's had a goal ruled out due to offside. The winning goal was scored midway through the second half. This is the second time St Joseph's have won the CIC Cup the last time being in season 2006-07. U14 Joicey Cup: Castle View Enterprise College 1 St John's RC 0. A successful first appearance in the final for Castle View. U16 Girls County Cup: Cardinal Hume Catholic School 0 St Bede's RC, Lanchester 3. This was the second time in 3 seasons that St Bede's have won this trophy. The following finals will take place at Eastbourne Sports Complex, Darlington. The 2019 Girls Inter-association competitions will be held at Biddick Academy, Washington. Rickleton Primary School were unable to progress from the semi-finals into the National final. The team suffered defeats in their first and second matches. In their third game the team were trailing by a 3 goal margin but recovered to gain a point from a high scoring draw. Both Tanfield School (U13 Boys) and North Durham Academy (U15 Boys) have made it through to the National final of their respective ESFA Futsal Trophy competition. The finals will be held at St George's Park. The following photographs have been kindly sent to us by Mr BJ Collins. 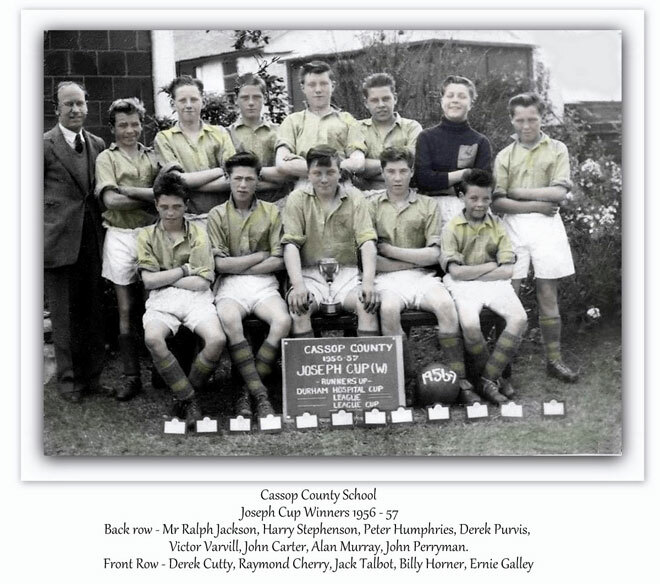 In the first photograph, front row second from the right, sits Billy Horner who represented DCSFA in 1956-57. 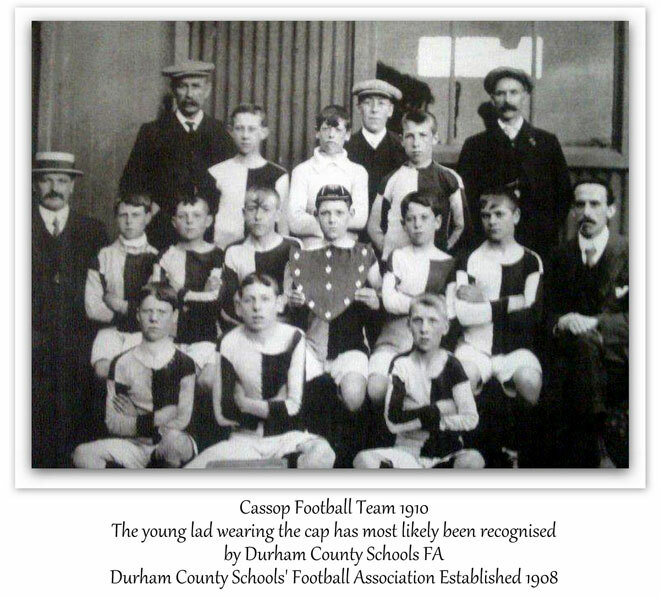 He went on to a have successful professional football career with Middlesbrough then Darlington. Billy became player-manager of Darlington before managing Hartlepool Utd. 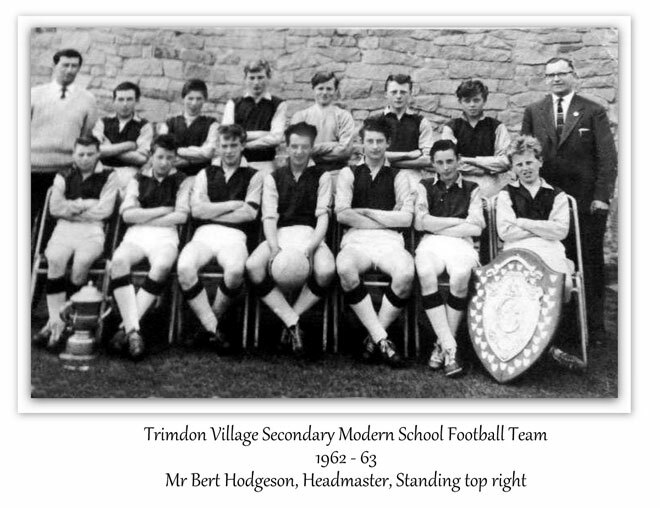 The third photograph has Mr Bert Hodgson who was chairman of DCSFA in 1970-71 and also treasurer of the County Schools FA. The U16 competition that we run is named in his memory. Back in Time: Click on thumbnail to view larger image then use PREVIOUS key to return. Harrison Cup (30.03.19): Redcar & Cleveland gained the point they required from their final match when they drew with fellow contenders, Stockton. This is the first time that Redcar & Cleveland have won the Harrison Cup. Harry Charlton Memorial Trophy (23.03.19): Washington lost their final match to Newcastle thus allowing Darlington to win the trophy. Derwent & Medomsley Cup: The final, between Chester-le-Street and Redcar & Cleveland, is on Saturday 27 April at Nissan Sports Club ko 10.30am. Ty McGurk 5-a-side Trophy Final: The competition was won, for the second time, by St Margaret's CE Primary School (Chester-le-Street PSFA). Year 4 Trophy: The first round is scheduled for Wednesday 20 March. Schools' Cup for School Teams: St Margaret's CE Primary School (Chester-le-Street PSFA) finished third in their group thus failing to qualify for the North region semi-finals. Small Schools Soccer Sevens: Browney Primary Academy (Durham City PSFA) suffered an extra time defeat in the semi-final thus narrowly missing out on a place in the national finals. Inter-association Trophy: Chester-le Street PSFA almost made it to the National finals but were beaten in the North region semi-finals. Schools' Cup for Girls: Easington Colliery Primary School (Peterlee PSFA) have again reached the National finals after being crowned the North Region champions. Rebecca Bell (DCSFA U16 Girls) attended an ESFA training camp in Eindhoven, Holland in preparation for the schools international programme for the Bob Docherty Trophy, which will be held during the Easter Holidays. Games were played against RKVV Jeka and FC Eindhoven. In both matches, which ESFA won, Rebecca scored the opening goal and in the second match added a further goal. During the Easter holidays the ESFA girls' squad will travel to Salou in Spain to participate in the Bob Docherty Trophy playing against Northern Ireland, Republic of Ireland, Scotland and Wales. Congratulations to Chester-le-Street, Washington & Derwentside SFA on reaching the final of this competition. Do you love football and aged between 10 and 12 years old? Do you wish to improve your football skills? Shincliffe Juniors FC are holding football training sessions for those with disability. Shincliffe Juniors FC is an award-winning football club and home of the 2018 FA National Grassroots Coach of the Year John McGuinness. Visit the FA website for further information of Disability Football.